City building games are a classic genre, dating back to the dawn of home computers. Titles like Sim City paved the way for decades of resource management games to grow and find their own identities. This Frostpunk review will dive into one standout in the genre of simulation management games, a Victorian-era inspired city building game that has a cool flavor all its own. The planet has been ravaged by the end of times, driving the environment into an eternal winter. Resources are scarce and the weather is brutal, making your management of the limited supplies very important. Frostpunk puts the player in a different future where steampunk rules the day. The industrial world must now adapt to survive in a literal crater of what was once a great city. As the leader, it’s up to you to not only bring people to your city but also keep the existing ones alive and happy enough to not storm your home and expel you into the wilderness to die, because that can happen. A lot of the broad strokes of this game will sound familiar. Using resource management to build a town and grow a population is not a new mechanic. Frostpunk takes these known tropes of city building games and adds in their own twists. We will point out some of our favorite details discovered while playing the game for this Frostpunk review. This isn’t the first resource management game to be withholding on the supplies needed for survival, but it sure is the toughest. The winter wonderland of a dying planet makes the chase for minerals, food, and energy sources that much more important. The world of Frostpunk is cold and uninviting, but it looks and feels different enough from the competitors to make it fun and engaging. The shortage of supplies and the high demands of a dying population drives a constant need for balance and coordination. The game does a great job of keeping the pressure on you to keep everyone happy but keeping just enough slack on the line to give you room to plan for future developments and expansions. There will always be something to worry about in this game, so just kicking back to relax and only focusing on building your city is not an option. The biggest thing working against the other games in this Frostpunk review is that they have no endgame. A narrative ending is not something you typically expect from a genre of games without narratives. Frostpunk cares not for your norms and has ended every game one way or another. Each scenario you play sets a different ending in motion, all determined by your actions. People will die, the world of Frostpunk demands it. The number of people that suffer and die sooner may just depend on your management skills. 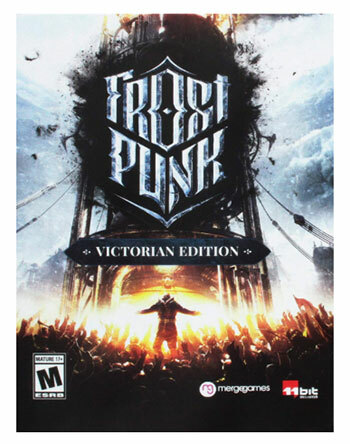 Frostpunk is available from many online game sellers as a digital download for around $20. There are a few special editions and add-on expansions that can affect the price, with the complete editions selling for around $30. We picked a few similar products available on the market to see how they compare for this Frostpunk review. 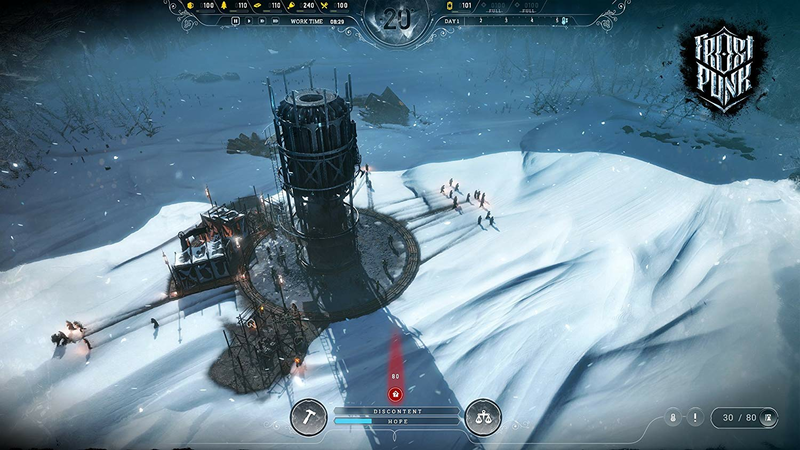 The City Must Survive - Frostpunk is a city-survival game where heat means life and every decision comes with a cost. As mentioned, Frostpunk can be downloaded for around $20. You are the leader of the last city on Earth. It is your responsibility to manage the everyday activities of your dying people and help rebuild the lost civilization of humanity. The world is cold, bathed in eternal winter, and offering little in the way of natural resources. The story is plain, but just enough to keep it interesting all the way to the bitter end. The graphics are on par with other games of this style, like Sim City or Cities: Skyline. This game opts for lower resolution graphics to maintain a rich and detailed environment of interacting entities. The visuals are rich and appealing to the eye, embracing the copper pipes and brass gears of the steampunk scene. The controls are easy to learn and can be changed in the options menu of the game. The ability to rebind the shortcuts makes it easy for new players to adapt to this tool set. This is not an easy game. Sure, the mechanics might seem familiar, but that’s where the similarities stop. Frostpunk is fun because there will always be an endgame in sight. While most simulation and city building games are open ended, this one has a final task ready to wipe your city off the planet, and there’s no ultimate way to stop it. You can try to feed and heat your citizens for as long as the harsh eternal winter will allow, but your fate will be met be it by exile order of angry citizens or complete breakdown of the food chain. The other games from this Frostpunk review don’t match the cold and brutal setting like The Little Ones. In fact, we would say this title is so bleak and hopeless that it’s not for children—a rare feature for a simulation game of this type. The add-on for This War of Mine brings a new class of survivor into the post-apocalyptic wasteland. Now, instead of controlling a well-trained soldier of fortune you are guiding and managing normal people; families with children. There will be a constant need to fight for resources to keep your family safe and healthy. The Little Ones will force you to make the tough decisions and decide who lives and who dies. This game is available online for around $40. You are a survivor in a wasteland that was once, not too long ago, your fruitful homeland. Now your homestead is buried behind the enemy lines of snipers. These sentinels are waiting in the tall towers around you during the day, picking off anyone that dare forage for supplies during the light. It’s depressing, horrific, and sometimes melancholy, but still feels exciting and fun—even when watching the world around you crumble and die. The Little Ones is a side-scrolling style survival game that embraces the pixel art of vintage 2D graphics. The detail may be stark, but the overall tone and feel for the environments help set the dark and hopeless tone of the game. The pixel art and color scheme make it a little easier to digest the more emotional aspects of the story, like watching men, women, and children succumb to the wages of the end of the world. The images may be low-definition by modern standards, but they serve the tone and flavor of the game perfectly. The controls were simple compared to the other games we played for this Frostpunk review. There aren’t too many keys to worry about, mainly just your character movement and your object/environment interaction. 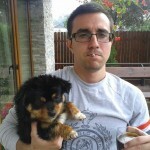 There is a lot of “pick up” this object or “push” on this object types of actions. The play feels like the older Lucas Arts games like Search for Atlantis or The Dig. Once we got over the sad overtones of the world we were playing, well, we really enjoyed it. The characters constantly need different resources, be it food, shelter, safety precautions, or medical attention. When most games of this type just end up feeling like a babysitting gig (we’re looking at you, Space Colony) this one feels like a high-pressure management situation. The demand is matched with the tools to get to get the job done though sometimes that requires more blood and sweat than you can offer. It’s easy to look at this game and compare it to Sim City. It’s true they both share a very similar aesthetic of game play, offering a ridiculous amount of variables and tools to toy with and perfect your city. That’s where the similarities break down because Cities: Skyline is bringing far more to the table than any of the other city building titles on this list. You must manage your tiny village until it becomes a center of global commerce and politics, managing everything from commercial tax bracket percentages to what streets are allowed to have oversized trucks on them. This game was the toughest competition in this Frostpunk review. This game is available online for around $30. There is no storyline, so that’s about all we can say for this category. These types of simulation games have never called for a storyline or narrative, save for the usual “Congratulations on being elected the new Mayor!” dialog box and a request to meet your advisors. This game has no narrative structure, but it doesn’t need one to work. We absolutely love the graphics of this game. The developers have put a lot of time and effort into getting the smallest details to fit and look right in this environment. Even at the closest zoom level, you can make out individual cars and citizens on the streets. This may seem like a purely visual quirk, but the detailed graphics aid in showing you everything from traffic, pollution, and even crime. So not only does the game look great, but it uses this high-definition rendering to make the gameplay experience even better on a simulation level. The control system is great, giving you full reign over the bindings and shortcuts. This really helps as you get into more advanced city planning where you need to institute different types of transport and utilities with just the right timing and balance. This control flexibility makes it much easier for someone new to this game to pick up the basics and move on to mastery of city management. This plays like most games in the category, slow and methodical. Even though it seems like the growth of your city may be slow, things happen fast once you get into a good taxation loop with the businesses in town. The better you make things at that point, the more people will want to move to your city. With proper management, you can have a metropolis in no time. The original Space Colony for PC was released nearly fifteen years ago, and that age is not helping it in this Frostpunk review. This is the oldest game we played for this article, but it still feels familiar. Think of it as proto-Sims in space, with a dash of classic Sim City thrown in for good measure. The graphics are poor, the gameplay is slow and stagnant, and the attempts at comedy are anything but laughable. Playing this game is not the fun you would expect from such a cartoonish presentation. This game is available online for around $10. The basic premise revolves around this ragtag group of would-be space explorers that now must coexist in an alien world to survive. The characters and location can change from game to game, so there is no real consistent interpersonal narrative that happens. No attempt was made at making a story that felt cohesive and logical for this game. It might seem unfair to judge the graphics of a game that came out so long ago, but this is a Frostpunk review, and there aren’t too many of these types of building and management simulation games out there. The graphics were passable at one time, but now they appear boxy and jagged compared to the other titles on this list. The controls were standard for this game genre. They were good about allowing customizing the bindings on the keys, a feature we always appreciate in complicated simulation and management style games. Even considering the age of this game, we have to say we were unimpressed with the lack of effort from the developers. The game looks and plays like the earliest betas of The Sims. There was a half-hearted attempt to add a challenge to the game with a wide variety of colonists, each with their own wants and needs based on a preordained set of personalities. Instead of having a complicated isolation drama about different travelers trying to get along and survive, you get a group of folks all screaming at you for attention. After going through all the games for this Frostpunk review, we have to say this steampunk-influenced simulation game is our favorite. While most games in this genre feel vanilla and repetitive, Frostpunk has an energy and challenge missing from the competition. Building and management simulation games aren’t meant to be an adventure, but Frostpunk has seen that as a challenge; a puzzle they are quite successful at solving. We really loved playing this game, and because of the exciting story and challenging, rewarding gameplay, we give this title four out of five stars.